President Donald Trump announced yesterday from the Oval Office that he is recommending Herman Cain for a seat on the Federal Reserve Board of Governors, calling him “a terrific person” and saying “I’ve told my folks that’s the man.” Cain was a presidential contender in the Republican Party in 2011 until sexual harassment charges derailed his bid. Trump’s announcement came just weeks after Trump proposed Stephen Moore for an additional open seat on the Fed. Both Cain and Moore have had close ties to Americans for Prosperity, a corporate front group tied to the Tea Party movement and created with money from the billionaire Koch brothers, Charles and David. The Koch brothers are majority owners of the fossil fuels conglomerate, Koch Industries. Mark Block’s LinkedIn profile indicates that he was Wisconsin State Director for Americans for Prosperity from 2006 through 2010. He then became Chief of Staff to Herman Cain and Chief Operating Officer of his presidential campaign. Ask any political reporter who covered Cain’s bid for the Republican presidential nomination what stands out in their mind about that campaign and they are likely to say that weird advertisement for Cain where Block takes a deep drag on a cigarette, slowly blows smoke at the camera as “I Am America” plays jubilantly in the background. A creepy, smiling head shot of Cain closes out the ad. That may be far too simplistic an explanation. The Koch brothers have a long, clandestine history with tobacco companies through one of their earlier nonprofit front groups, Citizens for a Sound Economy (CSE). In 2013 the health professionals’ journal, Tobacco Control, published a comprehensive report funded by the National Institute of Health (NIH), a federal agency. The report was titled ‘To Quarterback Behind the Scenes, Third Party Efforts’: The Tobacco Industry and the Tea Party. The report indicates that between 1991 and 2002, Philip Morris and other tobacco companies gave CSE at least $5.3 million. CSE was a pure Koch-created organization and considered an integral part of the Philip Morris strategy to thwart federal regulation of cigarettes and second hand smoke. The study shows that Philip Morris designated CSE a “Category A” organization for funding and it was assigned its own Philip Morris senior relationship manager. 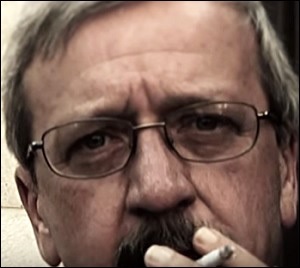 Block’s campaign ad for Cain, taking a deep drag on a cigarette, came five years after that decision was handed down. In 2004, the Koch-founded Citizens for a Sound Economy split into FreedomWorks and Americans for Prosperity. Today, the Kochs have another front group called Freedom Partners, which has been responsible for embedding a large number of Koch loyalists in the Trump administration. As of July 2018, eight of the nine members of Freedom Partners’ Board of Directors is a current or former Koch company employee, including the Chair of Freedom Partners, Mark Holden, who simultaneously serves as the General Counsel of Koch Industries. Also noteworthy, 12 lawyers from the Jones Day corporate law firm headed to important posts in the Trump administration on January 20, 2017 – Trump’s inauguration day. Jones Day had represented Freedom Partners as well as representing Koch Industries’ in its mergers and acquisitions. Americans have heard plenty from law enforcement about Russia’s interference in U.S. elections but nothing from law enforcement about the Koch’s long-term meddling in elections. It’s long past the time for that to change.